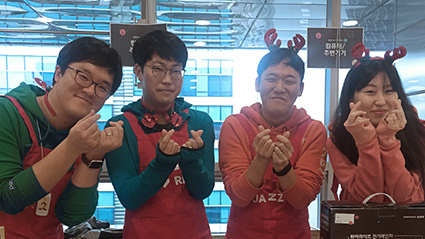 Kakao creates exciting changes with our employees, the Kakao Krew. The Kakao Krew genuinely participate in social contribution activities, including the regular donation program ‘Fund Together’ and social participation program ‘Act Together’. Kakao encourages our Krews’ donation and volunteer activities. One of them is ‘Fund Together’, a donation program the Kakao Krew participates in on a regular basis. The Kakao Krew can voluntarily make monthly donations of 2,000 KRW or more to one of the six contribution projects supported by Fund Together; charitable programs for children in Korea (Child Fund Korea), charitable programs for international children (Global Vision), rehabilitation program for disabled children (Purme Foundation), IT training for the socially marginalized (NPOIT – Non-profit IT support center), preservation of the Baekdu mountain range and wild animals (Green Korea United) and charitable program for low-income families in Jeju (Jeju Foster Care Center). Kakao also operates a “Matching Grant” plan, where the company donates the same amount as each Kakao Krew, which doubles the donations made by each Krew and encourages other Krews to participate. Act Together – Small actions that bring exciting changes, Act Together! 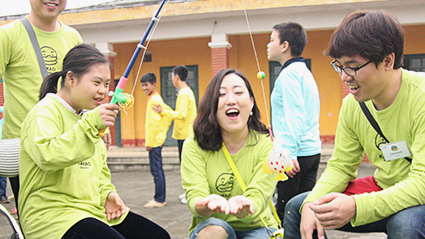 Kakao supports various volunteer activities to encourage our employees’ social participation. 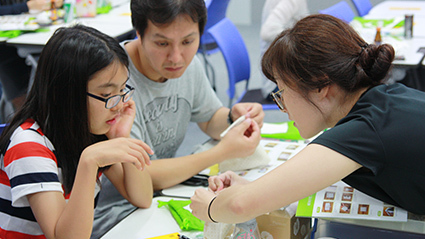 The Kakao Krew personally plans and executes volunteer activities they participate in through Kakao. The company provides expenses for the program and training, and connects the Krew with the organization they will be volunteering at, so that the Krew’s small actions can make enjoyable changes. The Kakao Krew continues to volunteer at the monthly free food kitchen Sarangmaru, hold cultural experience events at the Boys Town Sungsimwon, voluntarily makes bracelets and beads accessories, repairs houses in Jeju, and volunteers at the Clean Jeju Ole program. Moreover, the Kakao Krew participate in monthly volunteer programs planned by fellow Kakao Krews, such as IT career training programs, volunteer work at animal shelters, volunteer in making baby kits and participate in the Let’s Be Santa program.